← When the Economy Collapses, What is “Money”? All too often, the world is shaken by a new flu bug or the resurgence of an old one. This article caught my eye, as it’s about a mutated version of avian flu H7N2 that was transmitted from a cat to a human, quite a rare occurrence. I also have a long enough memory to recall the Ebola panic just a couple of years ago and shaking my head at the incompetence and poor decision making by those in authority, including the CDC. The history of Ebola, as detailed in this book, is helpful to know and understand how a deadly virus originates, mutates, and spreads. With an eye on the future and knowing a little about how quickly certain viruses can spread, I have put into place a number of preps that would see my family through the duration of a widespread outbreak, similar to the ones described in Steve Konkoly’s The Jakarta Pandemic. I know Steve personally and the massive research he put into this book, although a novel, is spot on. Read it to learn even more strategies to keep your family safe. So, if we can learn anything from past epidemics, we can fully expect to see many more viruses of every kind spread, to one degree or another. And, naturally, there will be even more cases of overwrought hysteria by the media and public officials. Another very concerning development where these viruses are concerned is the flood of immigrants from all parts of the earth whose health issues are unknown. Some carry highly contagious diseases, like tuberculosis, which have previously been very rare here in the U.S.
That said, imagine for just a moment that you and your family have been placed under an official quarantine lasting seven days, fourteen days, or even longer. No one goes to work, no one goes to school. You won’t be eating at restaurants, going to church, the bank, to the movies, or visiting friends. During a quarantine, you will be expected to be self-sufficient for everything except for your utilities. Preparing for something like this is a good excuse to really get going with your prepping if you’ve slacked off or are pretty new to the idea. Basic prepping for anyone begins with food and water. If you haven’t yet started storing food, here’s a list of some basic foods to begin stocking up. One simple strategy is to begin buying extras of the groceries you use more often and do that each time you go grocery shopping. If you’re the one who’s sick and possibly very contagious, you’ll need to have on hand a couple of week’s worth of things like canned soup, freeze dried meals, and other simple “open and serve” type meals. Make sure everyone in the family knows where this food is and how to prepare it. 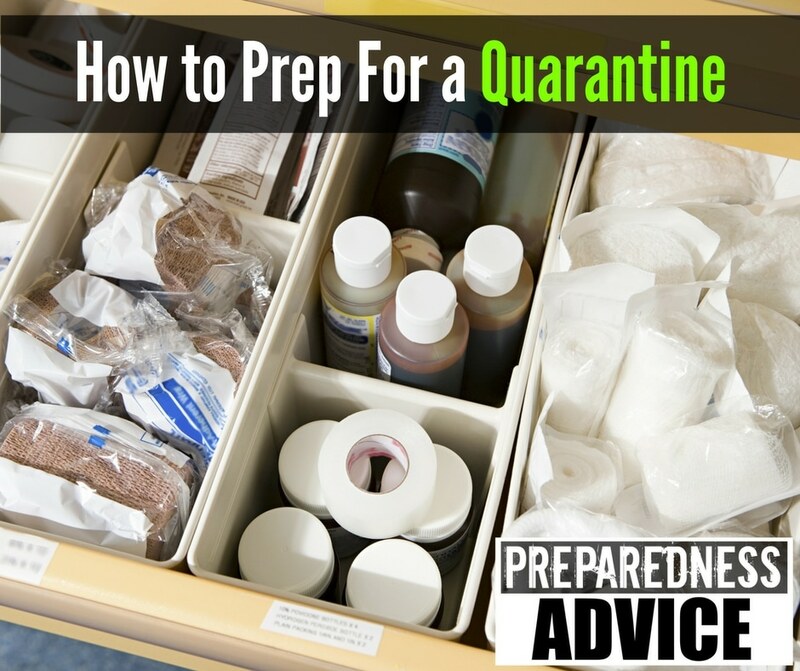 In addition to food, you’ll need essential non-edibles that are a part of your daily life but also a few items more specific for dealing with a quarantine and pandemic. Those would include soap, laundry detergent, toilet paper, hand sanitizer, bleach, black trash bags (the really heavy duty contractors bags), rubber gloves, N-95 face masks, medical quality disinfecting wipes, and medical disinfectant spray. An official looking quarantine warning sign would be a good idea. Keep in mind, in a true epidemic or pandemic, you will want to quarantine, even if no one in your household is sick. Hunker down at home and let the virus run its course, far from you and your loved ones. A quarantine sign will be a reminder to outsiders that you’re aware of the health scare and are taking necessary precautions within your 4 walls. At the same time, if any potential intruders are casing your home, that sign could possibly scare them away if they believe the virus is alive and well inside your house. Now would also be a good time to make sure you have a working thermometer or two, extra bottles of pain reliever, at least one humidifier, diarrheal medicines, and electrolyte drinks or dry mix as detailed in this article. If the virus is affecting the upper respiratory system, the humidifier becomes even more important, along with decongestants, many boxes of tissues (be sure they are immediately disposed of in something like this), lots of water for rehydration, possibly natural remedies you have found helpful (we use Boswellia tablets for coughs). The CDC has a helpful article that details complications from the flu — good to review, take notes, and plan to have on hand supplies to deal with this type of common virus. Once the quarantine is in place, you will probably not be able to go to a drugstore or pharamacy. In that case, you need to make sure you have an adquate supply of prescription drugs. I’m thinking, in particular, of asthma inhalers, since a number of flu viruses focus on the upper respiratory system. This could be particularly dangerous to an asthmatic. Depending on how severe the illness, you may need contractor-grade bags to hold refuse, biohazard bags, barf buckets, even gauze (or maxipads) to absorb blood. (Remember pictures of people with tuberculosis coughing up blood in old movies?) In the case of Ebola, the virus was found in bodily secretions of all kinds. That’s where rubber gloves, goggles, disposable Tyvex suits (not as expensive as most people think) and a biohazard clean up kit should be added to your supplies. Most people don’t give much thought to the pathogens that could be present in vomit, saliva, urine, and feces. They’ll probably grab some paper towels and maybe a bottle of Clorox spray, but an actual biohazard spill, or clean up, kit provides most everything you need to clean up and then dispose of potentially dangerous substances. Speaking of disposal, adding biohazard disposal bags provides you with a safer option for disposal of used medical supplies and even clothing worn by the sick person. Clothing, towels, and sheets used by the sick person will have to be quarantined away from those used by everyone else. Launder them separately and once the patient has recovered, throw them away. This is true of everything else used by the patient: cups, plates, silverware, etc. You can read her entire story here. If a pandemic becomes so widespread that professional medical care is impossible to access, you can still do quite a lot with basic medical knowledge and the right supplies. A quarantine will require that everyone stay home. If you have kids or grandkids, then you’ll want to make some plans now to keep them busy and entertained. Wash hands after every time they use the restroom. Immediately dispose of used tissues in a biohazard container. Stay away from the “sick room” without specific instructions from an adult. Know to wear protective clothing, including goggles and a face mask, around the sick person. Very young children who tend to not always follow instructions may need to be kept behind a barricade, such as a kiddie gate. Having the kids at home 24/7 may drive everyone batty, so it will be worth your while to tuck away a few books on CD, DVDs, books, and even school workbooks. Amazon carries the BrainQuest workbooks for various grades, and at over 300 pages each, surely they’ll keep kids busy for a long while. Also, have plenty of pencils and a good pencil sharpener handy. Puzzle books, board and card games, and indoor physical activity supplies (jump ropes, exercise videos, etc.) can help create a routine that, in turn, helps everyone stay sane. This article provides many more examples of how to set up a shelter-in-place routine. Finally, if no one is working during the quarantine, it’s possible your income might suffer. Your mortgage company, landlord, and utilities must still be paid right on time, so do a little financial planning to be sure that money is set aside in case the worst does come to pass. As always, it pays to be prepared in more ways than one. This entry was posted in medical, Sanitation and tagged diseases, epidemic, flu, pandemic, quarantine, shelter in place. Bookmark the permalink. My focus and strategy would vary depending on whether under quarantine with sick inside or to keep from getting sick. If virus free, the biggest challenge would be cabin fever. However, if dealing with an illness for longer than a couple of weeks, I need to add to medical and cleaning supplies. Any suggestions on how to handle pets during a quarantine? Also, what about disposal of bio-waste?